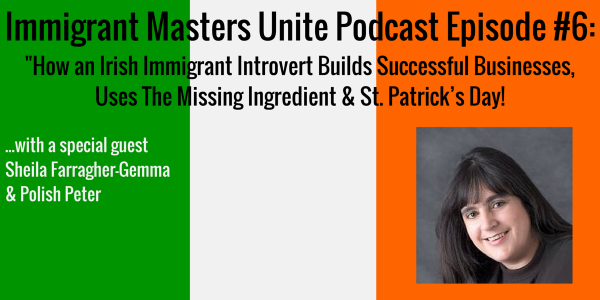 IMU 006: How an Irish Immigrant Introvert Builds Successful Businesses, Uses The Missing Ingredient & St. Patrick's Day! | Immigrant Masters Unite Podcast: Transform Your Business, Life and The World Around You! How Sheila’s sense of humor affected her when she came to United States. This is something new for many people because we don’t normally think about that but it’s very real. How she overcame the mantra of “Get a job” and started her first company. You’ll be surprised when you hear how she started it. The real success to success and why “working hard” is not enough. Sheila shares the missing ingredient and how you can use it to succeed in your own life. Biggest mistake most immigrant business owners make and how to avoid that. This one strategy can save you months, if not years of your struggle to build a successful business. So, join me today and download this amazing episode right now! There were a lot of laughs and some interesting facts about Irish and St. Patrick’s Day! sheilagemma at gmail dot com (make sure you put in the email right, I spelled it out to avoid spambots). So, what did you think? I would love to hear your comments and reviews on itunes and in the comments below. Don’t miss next week’s podcast where I am going to share with you an actual coaching call I did within my own coaching and accountability group. On that call, I talked about integrity and how it can transform your life not only professionally but personally. Imagine being able to have powerful conversations, be more productive and amazing relationship, all because of that one concept. In fact, I’ll share with you the 4 step process that takes less than 5 minutes to do to make it work. Stay tuned!